Split screen will never be the same again. Leo and Vincent are being chased through a hospital by police. Writer and director of A Way Out, Josef Fares, controls Vincent, while I control Leo. At first the action follows Josef’s fugitive as he barges through doors and takes sudden turns to avoid the pursuing cops. After a few minutes the camera dives into a vent, plunges down a few storeys and emerges to show Leo running into view. Now I’m in control. Police with flashlights crash through a door ahead and I take a swift turn. Then I hammer a button to kick through a door and flee into a new wing of the building. Soon the camera swoops back to Stefan once more, but when it boomerangs back to me the game changes style. The camera fixes to a side-on view and suddenly I’m playing a side-scrolling beat ‘em up, mashing the attack key to watch Leo spectacularly beat up a queue of bobbies. A Way Out is an experimental co-op game that tells the story of two convicts on the run from the law. You only need one copy of the game between you to play, and you can play locally or online (though local couch co-op is the approach Josef recommends). Often you play across a split screen, but the boundary between the two characters can shift left or right to give greater focus to one guy or the other in important moments. Sometimes the screen will split horizontally, if that’s the perspective the action requires. Sometimes, as in the hospital chase, the action quickly flips from one to the other. 'Cinematic' is an overused term in games, but it's impossible to ignore Josef Fares' history as a film director. The camera motion in the hospital chase scene shows flair and there's a strong pacing contrast in the hospital scene. Before the police arrive you and your co-op pal chill in the lobby and chat to lingering NPCs, which reveals a little more about Leo and Vincent's contrasting personalities. Alternatively you can play a game of Connect-Four together, or compete to hold wheelie positions in some spare wheelchairs. Josef says these minigames are everywhere, and sometimes form the core of a scene. In another sequence in the wilderness he splashed around to send fish in my direction so I could spear them and cook them up. A Way Out could last 15 hours if it rotated between talky bits, stealthy bits and shooty bits, but instead it lasts eight hours and aims to maintain a sense of novelty throughout. In each section the developers essentially redesign the game around a story beat. Next up we load into a stealth section that has us sneaking through bushes and co-ordinating to knock out guards. Josef tells me that stealth section format doesn't repeat again. A Way Out could last 15 hours if it rotated between talky bits, stealthy bits and shooty bits as so many story-driven action adventure games do, but instead it lasts eight hours and aims to maintain a sense of novelty throughout. This means that, by necessity, interactions in each section are basic. The beat ‘em up section only has one attack button, for example, because it last for a minute and vanishes forever. 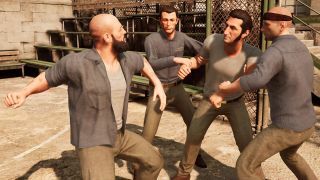 As a result A Way Out feels like a deeper take on Telltale’s Walking Dead adventure games, but given that it’s designed to be a knockabout couch co-op adventure that’s about the right level of complexity. Fares doesn't want players focusing on complex control schemes, he wants to encourage discussion between co-op partners. A Way Out does this by regularly asking you to choose between Vincent’s cerebral approach to a problem and Leo’s no-nonsense (often violent) approach. In a lot of scenes the player that approaches a story trigger point first gets thrust into the driver's seat, literally in the case of one scene in which I found myself driving a squad car slowly through a police blockade on a bridge. I could have pressed a button to floor the accelerator and crash through. If Fares had taken the wheel, he would have had the opportunity to choose instead. It's easy to see how these set pieces will inspire some entertaining arguments. It's difficult to judge the characters and story after a brief overview, but I already like that A Way Out disregards a lot of game conventions. It's a co-op game that isn't primarily about combat; it shifts between genres from scene to scene; and the game is designed to be lean, and last only as long as the story needs to. The gruff crooks you play might struggle to deliver the emotional gut-punch of Fares' last project Brothers: A Tale of Two Sons, but the inventive scene-shifts and unique take on co-op could create some surprising moments. Plus we're sorely lacking for great couch co-op games on PC. This clever crime caper is most welcome. A Way Out is due out on March 23.